variable to 5 Volts, and pulse widths variable from 10 ns to 200 ns. 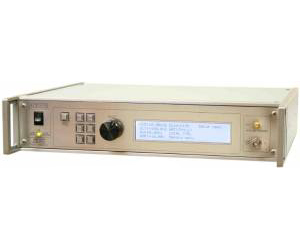 The higher-voltage AVMR-2 family provides pulses with amplitudes variable to 20 Volts, and pulse widths variable from 20 ns (10 ns for -B units) to 200 ns. The maximum pulse repetition frequency (PRF) is 10 MHz. The rise time of the computer-controllable -B units is fixed at 300 ps. Instruments with the -B suffix include a complete computer control interface. This provides GPIB and RS-232 computer-control, as well as front panel keypad and adjust knob control of the output pulse parameters. A large backlit LCD displays the output amplitude, frequency, pulse width, and delay.